Disney’s engineers used special software to make a magical, authentic body of water. In the early days, when motion pictures were still new, filming the ocean was a radical idea. A surface-level shot of the waves was certainly feasible, but capturing footage of swaying undersea fauna, swimming fish, and marbled sunlight dancing on the seafloor? The consensus was: It couldn’t be done. In fact, it could be. A century ago, the brothers John Ernest and George Williamson, the sons of a sea captain and inventor, would prove it. To do so, the Williamsons turned to a piece of technology their father had designed for divers in undersea repair and salvage jobs. The device was a series of flexible concentric tubes, “interlocking iron rings that stretched like an accordion,” as the Library of Congress puts it, made to suspend from a specially outfitted ship so that a diver could descend into a watertight chamber below. At one end of the tube was the boat on the surface of the water; at the other, the submersible room. John Ernest and George were enchanted by their father’s machine. From the glass portals along the tube, they observed red snappers, yellowtails, fat groupers, and other shimmery creatures weaving through the coral reef of the Bahamas. And they had the idea of bringing a camera with them next time. Later, when they shared their still photos with newspapers—images included a blurry oblong shark and shadowy seaweed—it created a sensation. At the time, the footage was extraordinary. The film was a smashing success. Filmmakers have been using technology to push the limits of how the ocean is portrayed ever since—and not just in live-action films. Most recently, Disney dazzled audiences with the animated film, Moana, which tells the story of a girl from the Pacific Islands who sets out on a voyage to rediscover her ancestors’ wayfinding heritage. Moana’s directors, Ron Clements and John Musker, have been obsessed with stories about the ocean for decades. They made The Little Mermaid in 1989. The 1940 film Pinocchio, with its famous whale sequence, is what first inspired Clements to pursue a career in animation. But depictions of the ocean in those stories are nothing like what audiences see in Moana, which is as groundbreaking for its portrayal of water in 2017 as 20,000 Leagues Under the Sea was in 1916. “Water is always hard,” said Marlon West, the co-head of effects animation for Moana. “Usually, in animation, we have a dozen water shots. They’re hard to do.” In Moana, however, the majority of the movie involves water. And the ocean isn’t just a presence; the action takes place on the water, introducing yet another layer of complexity. On top of that, Moana’s Pacific ocean is occasionally anthropomorphic, like a distant cousin to the water in James Cameron’s The Abyss. Disney’s software team came up with a program it calls Splash—a companion to Matterhorn, which was used to create the snow in Frozen—to help automate the way the water would behave in various shots. Splash is a “fluid solver” that plugs into Houdini, third-party 3-D animation software. To use the solver, effects specialists would define the area they wanted to simulate—say, a section of water around an animated boat—then use a setting to determine what the ocean condition should be like to begin with. From there, they’d run the simulation on the pre-determined ocean surface, to animate how that area of water responds to the boat. The output from that simulation—“millions of particles,” essentially millions of new points of animation data—would then be smoothed into the final rendering of the film. 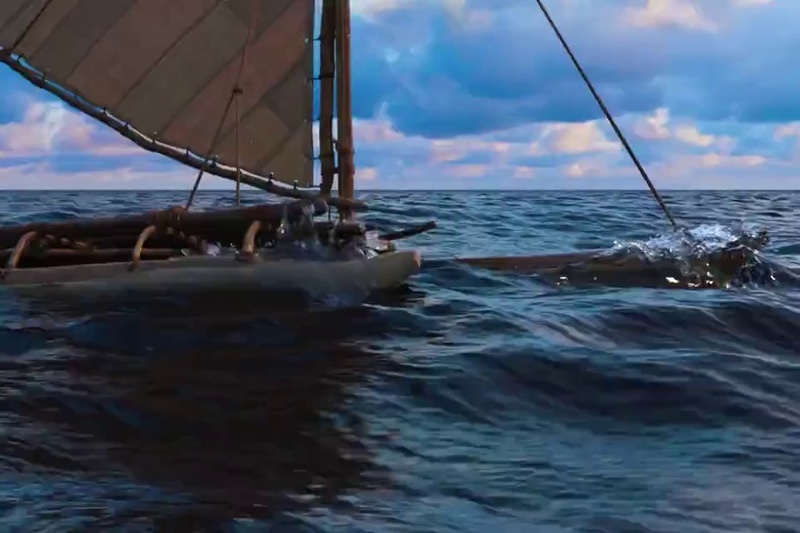 The ocean in Moana is an anthropomorphic force that occasionally nudges Moana along the way. Except the ocean character doesn’t have a face. And it doesn’t talk. (In this way, it was a bit like the animated magic carpet in Disney’s Aladdin, Osnat Shurer, the Moana producer told me.) So Disney’s effects specialists and animators were constantly navigating the tension between wanting the water to look and act like actual water—but to be magical at the same time. When the film project began, however, the Disney team had no idea how they could portray all this complexity—even just from a technological standpoint. Not to mention the separate but related challenge of animating an anthropomorphic volcanic island. The project also changed the way that animators and effects specialists think about the actual ocean. Ramos, the effects lead, told me she spent more than a year and a half working on getting the shoreline animation just right. Even now, she says, she can’t go to the beach without noticing things she’d never considered before her work on Moana.